The only son of Augustine Tezza, a physician, and Catherine Nedwiedt. His father died when Louis was nine, and his mother moved to Padova, Italy. Entered the Ministers of the Sick of Saint Camillus de Lellis (Camillians) on 8 December 1858 at age 17 at Verona, Italy; his mother then became a nun. Ordained on 21 May 1864. Worked four years in the formation of new religious. Had a chance to become a missionary to Africa, but his superiors were against it, and transferred him to Rome, Italy as novice master. Transferred to France as novice master there in 1871. 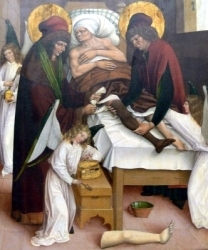 Provincial of the Order in France where he established facilities to support the spiritual and health needs of the sick. Expelled from France in 1880 during the suppression of religious institutions. Returned covertly, and united the scattered religious around the country. Procurator and Vicar General of the Camillians in 1891. During a retreat in Rome in 1891, Louis met Blessed Josephine Vannini. They had each been drawn to forming a women's congregation in the spirit of Saint Camillus de Lellis. They prayed over the matter, and on 2 February 1892 they founded the Congregation of the Daughters of Saint Camillus. The Congregation received papal approval in 1931, and continues to grow. Sent to Peru as Official Visitor in 1900 with the mission of reforming the Camillian community. The members there had been separated from the Order hierarchy for a century, and risked suppression. The job was intended to be a short one, but when it came time for Father Luigi to leave, the archbishop and nuncio asked him to stay; he remained in Lima his remaining twenty-three years. Reformed and re-established the Camillians, worked with the sick poor in hospitals, homes and prisons. Confessor and spiritual director to the archdiocesan seminary and several Congregations; counsellor to the nuncio and archbishop. Helped Teresa Candamo found a new Institute. Twin brothers. Physicians, trained in Syria; the brothers accepted no payment for their services, and their charity brought many to Christ. Reported to have miraculously replaced the ulcered leg of a man named Justinian with one from a recently deceased man. 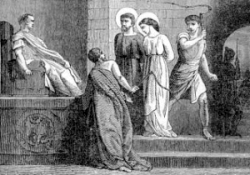 Arrested during the persecutions of Diocletian, they were tortured, but suffered no injury. Martyrs. Many fables grew up about the brothers, connected in part with the ability of their relics to heal. Nun in the Sisters of Saint Regis. Novice mistress and house superior in La Louvesc, France. Superior general of her order. With Father Stephen Terme, she founded the Congregation of Our Lady of the Retreat in the Cenacle, in La Louvesc in 1826; it began in a mountain hostel for women pilgrims, and its ministry spread to the conducting of spiritual retreats. Sister Marie resigned as superior in 1838, and lived her remaining years as a humble sister. Son of Greek immigrants to Italy. He led a wild and mis-spent youth, eventually finding work as a treasury official. Believed to have been married, and certainly the father of one daughter. In quick succession, his wife died, his daughter died, and Nilus suffered a life-threatening illness; all this at the age of 30 led to a conversion, and his life's work proved it was a true conversion. Basilian monk at the abbey of Saint Adrian in Calabria, Italy. Fluent in Greek and Latin. Hymnographer. Lived sometimes as a hermit, and sometimes he travelled from one monastery to another. Supported Pope Gregory V when he was driven out of Rome, then opposed him when Gregory and Emperor Otto III when they used excessive force against the forces of the anti-pope. Abbot of Saint Adrian. In 981 the invading Saracens drove the monks into exile at Vellelucio. On his deathbed, Nilus proclaimed Vellelucio to be the new home city for the abbey, and the house of Grottaferrata has been there since. 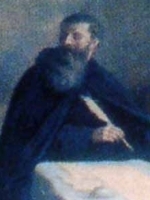 Spiritual director of Saint Bartholomew of Rossano. Cyprian was a pagan magician, Justina a beautiful young maiden who had consecrated her virginity to God; she became the target of obsession by Cyrpian who tried to use his dark arts to seduce her. Instead, she converted him to Christianity; Cyprian went on to become a priest, and then bishop of Antioch, Pisidia. They were both eventually martyred in the persecutions of Diocletian. Eleventh century BC Judge of Isreal. 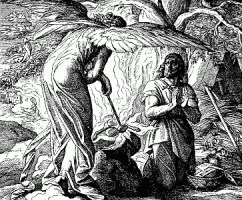 See the separate reading for the Old Testament account of his life. Priest in Milan and Como, Italy. Following a vision of the Virgin Mary, he joined the Humiliati in 1134, and worked for their adoption of the Benedictine Rule. Founded other monasteries in the areas of Milan and Lombardy. Served as abbot, and introduced the Little Office of Our Lady. Raised in a peasant family, Stephen early felt a desire for religious life, and became a monk. Spiritual student, friend and travelling companion of Saint Nilus the Younger, he was noted for his zeal for the monastic life and desire to spread the faith. Priest. Friend of Pope Saint Gregory the Great who compared Amantius to the Apostles for his miracle working. One of a group of 50 African soldiers martyred in the persecutions of Diocletian. Sixth-century spiritual student of Saint Illtyd. Hermit. Several churches in Wales and Cornwall are dedicated to him. Nephew of Saint Columba of Iona. Founded monasteries in Lynally (Land-Elo, Lin-Alli) and in Muckamore in Ireland. Wrote the Alphabet of Devotion. Bishop of Bologna, Italy c.370. Friend of Saint Ambrose of Milan. Fought against Arianism. 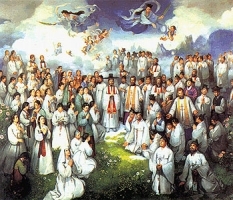 Twelve lay people in the apostolic vicariate of Korea who were imprisoned, tortured and martyred together in the persecutions in Korea.